88 Middle Street has been a restaurant operating under the name Hugo's for 25 years, since 1988. Some say it was, under former owners Rob Evans' and Nancy Pugh's purvey, the restaurant that put Portland on the national food map. When three of its employees, Arlin Smith, Andrew Taylor and Mike Wiley, took over its ownership, they aimed to vault the already respected establishment to a new level of style, polish and renown. In February, they closed the doors and set about an extremely ambitious overhaul of the space and, with our help, the brand. 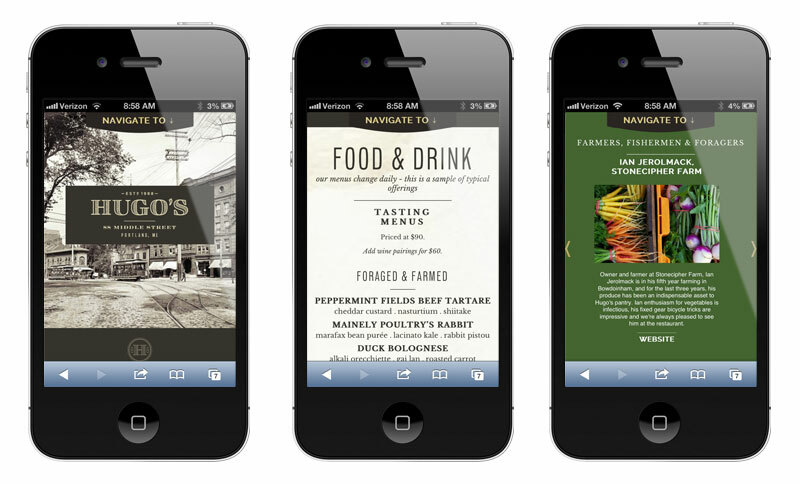 One of the most fascinating parts of working on the re-brand was the way in which Hugo's needed to simultaneously speak to and contrast with the owners' other restaurant, Eventide Oyster Co, which is next door and for which we designed branding last spring. Arlin, Mike & Andrew saw the two spaces as complementary opposites from the very beginning. They designed the bar in Hugo's to mirror the bar in Eventide, so that if you were able to see the two from above, they would form a continuous line surrounding the two restaurants' shared kitchen space. We looked at Eventide, with its blues and whites and pale wood, as formed of air and sea. As a counter to that, Hugo's is earth and forest. It is leather, dark wood, and touches of leafy green. Eventide is breezy, sparse, and light; Hugo's is rich, lush, and deep. We knew diners would linger at Hugo's, sinking into a leather chair, sipping a pre-dinner drink, exploring an eight-course tasting menu, and ending with a few sweet bites and a digestif or a craft coffee. Throughout the process, we influenced and were influenced by the decisions that the owners were making in the physical space: the softly polished reclaimed wood, the exposed brick, the touches of cast iron and vintage industrial hardware, the crisp contrast of white schoolhouse lights on the deep brown tin ceiling… the end result exudes a warm, comfortable seriousness evocative of the libraries, lodges and social clubs of yore, but with an undeniably contemporary twist. Everything about the space lends itself to immersion in a series of special moments, and we worked to do the same thing with the brand design and collateral. The logotype was custom-designed by Greyletter. There are versions for use at various sizes, each with the scale and weight of the letterforms' internal shading adjusted to ideally suit the end use. Building signage is limited to crisp gold foil type on the windows. Printed materials are letterpress printed in one color on matching brown and natural white stock (Neenah Classic Columns). We paid special attention to word-smithing, carefully choosing alliterative and historically-inspired phrasing for menus and signs. And there are nods to Portland history — the great fires, the temperance movement, the Old Port as center for manufacturing and shipping. The typography is a mix of old and new. Late 1800's Bodoni pairs with the modern minimalism of H&FJ's Tungsten. Touches of Gotham typographically tie Hugo's design to that of Eventide next door. We worked with Strong Arm Bindery to design four individual books and holders for the beverage list, tasting menus, dessert and coffee, and finally, the check presentation folder. Each one is crafted by hand from custom-dyed leather and book cloth. 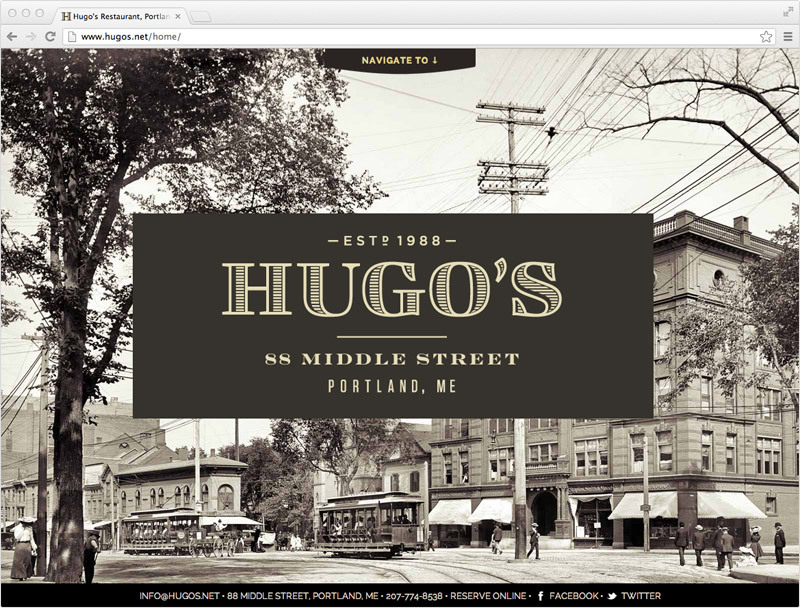 Hugo's website roughly mirrors the structure and functionality of Eventide's, but with slightly more elaborate content and a completely new brand-appropriate visual appearance.